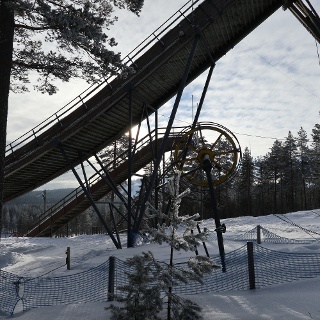 Vuokatti's most popular ski track is Vaara's illuminated ski track from Vuokatti Sports Institute to Heikkilä. 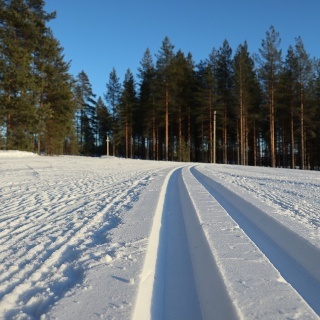 This track is for normal fitness skiers to top athletes. The trail is a lit circular track. Halfway in top of Ohravaara is the resting place Heikkilän Pirtti. Skitrack to Heikkilä becomes one-way in the intersection of Pyykorpi. Return track from Heikkilä to Vuokatti Sports Institute is a different route than the one where you came from. The track is two-way in the intersection of Kettumäki and after that it is one-way. After the intersection of Kettumäki, return tracks downhills are speedy. Leave safety gap between you and the person who is skiing front of you, and control your speed. The Heikkilä Pirtti ski café will be operated during the winter season 2018-2019 by Catering Sutipurikka. At the starting point there is Vuokattihall with dressing rooms and showers, an indoor swimming pool and a café. START: From the corner of Vuokattihall, follow the signs & signposts "Vaaran valaistu latu"= "Vuokatinvaara illuminated ski track". Halfway of the route is Heikkilä Pirtti. Return to Vuokatti Sports Institute. Skiing to Heikkilä is about one and a half times as long as the return trip to Vuokatti Sports Institute. 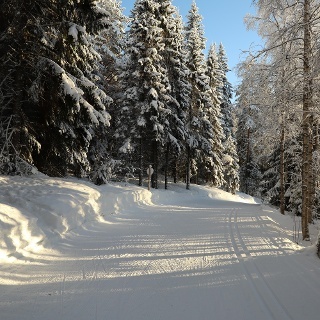 The track departs from the corner of the Vuokattihall parking lot towards the fells of Vuokatti to higher terrain. 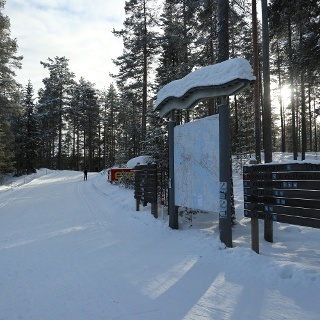 The trail passes behind the ball hall of the Vuokatti Sports Institute, where the trail branches in several directions. As we go to Heikkilä we turn to left. The trail is sloping and slightly ascending, about 2.3 km up to the intersection of Käkinotko. At the junction, the trail diverges to the right to real Vaara's 9 km race track. The illuminated trail continues to the left and at the same time begins a steeper upward part about 500 m long. From the top of the hill it is about half kilometer flat steady skiings, past Ainolas hut and then you arrive to the junction of Pyykorvi. In this intersection of four ski tracks be aware that the track to Heikkilä continues slightly left as a oneway track. Vaara´s illuminated return track unites at this point to this track. 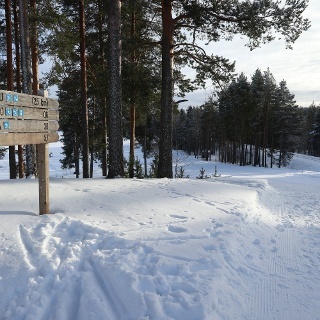 At the junction there is also a ski track to the right, Vaara race tracks. The trail to Heikkilä continues in a pleasant forest landscape gently sloping about 1.7 km, with two small roads to cross. After crossing a road on halfway, starts about 1 km long ascent to top of Ohravaara, where your prize is a spectacular scenery and the Heikkilä Pirtti's food. Th return track starts from behind the house on the edge of the field and the way back to Vuokatti Sport Institute is mostly downhill. Return track goes in top terrain, on the side of fields, through spruce forests and birch forests. 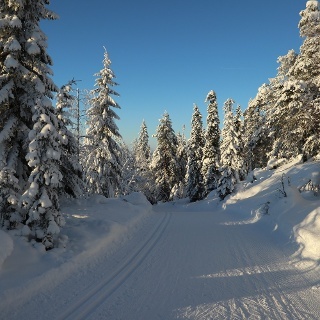 From the Kettumäki junction (2,4 km from Heikkilä) to Heikkilä, ski trail is two-way. After Kettumäki descents are fast and bring the skier to the Pyykorvi junction, where the track is again two-way until you come back to Vuokatti Sport Institute. There are buses running between Kajaani and Sotkamo along the road past Vuokatti Sports Institute. Follow the instructions to the Vuokatti Sports Institute. Free parking in Vuokattihall parking lot.